Referencing the CD by Prof. Tom Perera, W1TP, Telegraph Collectors Reference CD, I was able to show various keys which I had used from my first days with CW. Then followed with more details about modern keys and keyers. 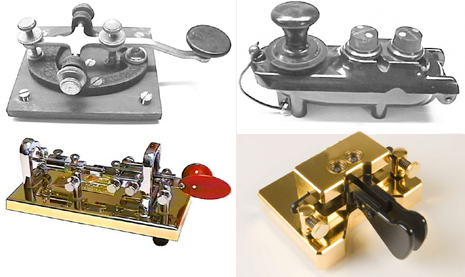 The subject of how to learn Morse followed starting with some recordings by the US Army Signal Corps. made during WWll. These were from rather scratchy 78 rpm records. Although there are some 48 in the complete set, only small samples were played. Some tips were given on how to best get started in learning and practicing the code. Discussions followed when other members related their experiences and showed their keys.